IF BlackBerry’s latest offering, the BlackBerry Classic, invokes a strong sense of déjà vu, don’t fret. All this is intentional. The new model is essentially a throwback to the good old days when physical QWERTY keyboards ruled the mobile landscape circa 2008. It was launched in December, several months after BlackBerry unveiled its peculiar-shaped and highly vilified BlackBerry Passport. With the Classic, it seems that the once-popular smartphone maker is taking a step back in order to move forward. Problem is, we aren’t sure if this is the best way. This device combines older navigation items like the classic trackpad with the new BlackBerry 10 operating system, and its 720×720-pixel square display is considerably larger than the one on BlackBerry Bold from 2011. 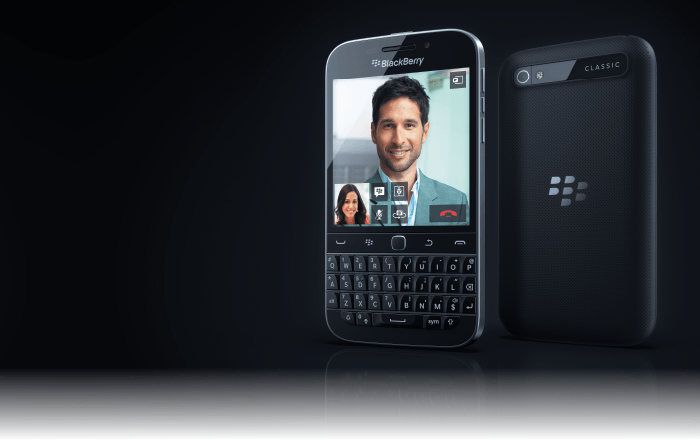 The phone runs on BlackBerry 10.3.1 and packs a 1.5GHz Qualcomm Snapdragon processor with 2GB of RAM. What BlackBerry is probably hoping for is the déjà vu effect to win back old fans. BlackBerry CEO John Chen compares many of the Classic’s features to the Bold, anticipating that some loyalists will upgrade to the new device. Ultimately, what the Classic offers is its old school, if not antiquated, BlackBerry navigation, including the Menu, Back, Send and End buttons which are standard across older BlackBerry devices. That could sway some fans to go back to the platform, especially now that BlackBerry has closed some of the app gap by allowing BlackBerry 10 devices to run Android apps via Amazon’s Appstore. This time round, I put the Classic to the test at the recent St Jerome’s Laneway Festival in Singapore. On the road with leisure and some work in mind, the device had more misses than hits. Upon arrival in Singapore, navigating the BlackBerry’s Maps app made me pine for the ever-trusty Google Maps function that is standard in most smartphones. The map function on the Classic is unadorned and not nearly as sophisticated as Google’s. The map rendered slowly when I tried zooming in and out, which can be frustrating. If you’re the kind of smartphone user that likes to have a lot of apps, the Classic isn’t for you. The miserly-sized app store is still one of BlackBerry’s biggest downfalls. Essential apps like Facebook and Twitter are already pre-installed but other popular apps such as Instagram, Spotify and Uber can only be acquired through Amazon’s Appstore. With Android or iPhone devices, there are a panoply of apps that can be downloaded in an instant, which might not necessarily be available on a BlackBerry. Also, there are too many shortcuts for launching apps and equally as many ways to do the other things, which complicate rather than simplify life. For example, to minimize an app, you can swipe up from the bottom of the screen, or press the Back or End button. A BlackBerry in a music festival? If there’s one thing that BlackBerry phones get right, it is durability. The Classic’s case is built like bulletproof armour. It was pouring for a good one hour at Laneway and I had accidentally dropped the device on the wet tar road. However, it bounced back without a bruise and appeared to be good as new. The 13×172.4×10.2mm device also has a nice weight to it (178g), and the textured back is sleek and gives a firm grip. Its 2,515mAh battery fared better than I expected. The device lasted me a whole day of texting and updating my Twitter and Instagram with still about 22% of battery life left at the end of the day. At eight megapixels, the rear camera offers an image resolution of 294ppi (pixels per inch) and comes with an LED flash. The image quality is nothing spectacular, and the shutter and autofocus system are relatively slow. After a while, I decided to go back to my LG Nexus 5 for picture and video-taking. Previously, BlackBerry flirted with touchscreen smartphones but quickly realised that it was the physical keyboard that is its unique selling proposition. The feel and functionality of the Classic’s keyboard is impeccable. Typing a 500-word blog post on the device was more of a pleasure than pain. That’s really how solid the keyboard is. If the majority of your day consists of churning out emails, reports or articles on the go, the Classic’s keyboard is a must-have. While using the device, be it to browse the web or access apps, I noticed that I didn’t use the trackpad even once. For me, it was completely redundant. When searching for word definitions or anything on the Internet, the BlackBerry Assistant feature (similar to Siri or Google Now) is accessible by pressing the Mute button on the right side of the phone. This and the universal search (just start typing from the home screen) features are pretty neat, but they feel like catch-up features with little, if any, advantage over the other notable players. On the MRT ride from Pasir Ris to Bugis, I decided to play Fun Run. From this, I realised that the Classic is to an iPhone what a basic business laptop is to a MacBook. The Classic is powerful enough to do low-power activities such as sending an email or browsing the web but it is not in the top league for rich entertainment experience like watching videos and playing games. Most of the games also don’t work with any of the hardware buttons on the Classic, making it wasted keyboard space and leading me to have only half the fun. It was hard to watch widescreen videos on the square screen, which caused them to shrink in size, and I coveted my friend’s Samsung S5 while she watched the trailer of Into the Woods. On top of that, Android apps run slightly slower since they are not BlackBerry’s native apps. Within a period of 30 minutes, I experienced a handful of crashes and freeze-ups to my annoyance. I arrived at Bugis Station and needed to text a friend of my whereabouts. The BBM has been updated with fancy stickers but I honestly don’t know anyone who still uses it. WhatsApp it is. The BlackBerry Classic may have the best QWERTY keyboard in the market, but that does not seem strong enough a case to purchase it. It’s definitely a phone for keyboard lovers. But if you’re looking for something that can satisfy all your tech and lifestyle needs, you’re better off with an Android or iPhone device. The BlackBerry Classic is officially priced at RM 1,588 in Malaysia. This article first appeared in #edGY, The Edge Malaysia Weekly, on February 2 - 8 , 2015.